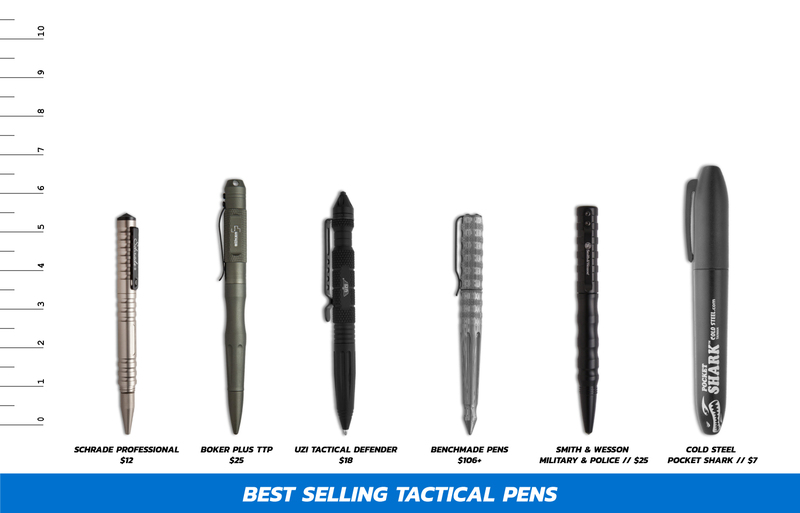 This buying guide is a resource for the best tactical and self defense pens, along with what to look for, types, popular brands, laws, and more. Tactical pens double as writing devices and self defense tools. You know, just in case you’re doodling and a mugger sneaks up behind you. Or you get trapped in a car and need a quick glass breaker. Tactical pens are just handy to have around. Overall Length 5.75" 6.125" 6.00" 5.25"+ 5.80" 6.50"
Diameter 0.51" 0.48" 0.57" 0.20"+ 0.40" 0.875"
Weight 1.38 oz. 1.40 oz. 1.80 oz. 1.30+ oz. 1.60 oz. 1.70 oz. The things tactical pens have in common are: 1) They’re tactical, and 2) They are some sort of pen. Jokes aside, tactical pens come in a few different varieties. As you saw above, most are regular fountain tip or ballpoint pens, but there are also other types like markers. Some even have styluses and handcuff keys built in. Find the self defense pen with the accessories you’ll use. Tactical defense pens come in a variety of styles, each with different tools and uses. These pens can feature glass breakers, DNA catching crowns, handcuff keys, etc. And surprise, surprise, most tactical pens have an actual pen tip that can write. The best tactical pens are built to be tough. They boast stainless steel or aluminum frames that can take abuse and still function as a writing tool. Pens with pointed glass breakers often have carbide tips to accommodate all your breaking needs. Bottom line: You never know when you’ll need some handy tactical pen action in your life. Benchmade builds their tactical pens to be strong and be able to take hard use, much like their knives. Benchmade tactical pens sport sturdy pocket clips and are great for a last resort survival tool. UZI is a very popular brand that makes some of the best tactical pens available. UZI pens have a hard anodized aluminum body and retractable pen tip. The pocket clips make them great for EDC. Schrade tactical pens include a fountain tip and rolling ballpoint for super smooth writing. Not only are they great for writing, they’re built tough to make any tactical situation a breeze. Smith & Wesson makes anodized aluminum tactical pens that are lightweight and strong. Included on each pen is a pocket clip and glass breaker tip. Cold Steel is the company behind the popular Pocket Shark. It’s a permanent marker that doubles as a tactical pen! This strong little self defense pen is great to have wherever you are. Boker is known to make sturdy knives built with quality. Their tactical pens are no different. Boker has many models of pens so you can get one to match every outfit you own. CRKT has a few models of self defense pens that are all great options. Each pen is designed by Allen Elishewitz and is crafted with tough 6061 aluminum. Gerber tactical pens are built with strength in mind. The popular Gerber Impromptu models are all made in the USA with strong, lightweight materials. Gerber defense pens make great EDC options. Let’s tread into the murky waters of tactical pen laws. Tactical pens are not considered knives, so they usually don’t get the same treatment. That said, these pens can be seen as weapons in some parts of the country. Sometimes it depends on the style of the defense pen. Sometimes it’s the intent or the way the pen was used in a situation. See why these are murky waters? Look up the laws for your state and area. If it’s legal and safe for you to carry, you know where to find yours. Tactical defense pens can make great companions for everyday carry. They act as writing devices, tactical items, and defense tools when you need them most. Need to brush up on your tactical skills? Or maybe you just want to see them in action. This is the video for you.